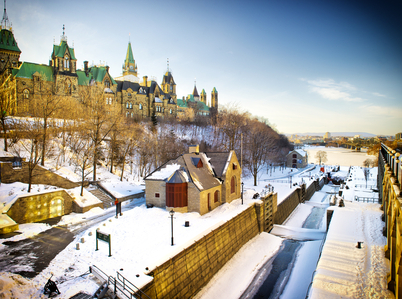 Want to visit Ottawa this winter? 7 things you won't want to miss! With its beautiful architecture, world class museums, cosmopolitan feel and gorgeous hotels, Ottawa is always a great city to visit. Personally however, I believe that it’s the Winter months when Canada’s capital really shines. It might be cold, perhaps even freezing, but when the temperature drops, so does the snow. And there’s just something magical about Ottawa when it’s blanketed in snow and ice. From the world’s largest ice rink to the magic of Winterlude, here are seven reasons why I believe Ottawa is the perfect Canadian city for a short break this Winter. Most people are surprised to learn that Ottawa is home to the world’s largest outdoor skating rink. The Rideau Canal Skateway is 7.8 kilometres long and has officially been named a UNESCO World Heritage Site. It’s located in downtown Ottawa and is open from January until February. Skate rental is both affordable and available on site. If skates aren’t your thing, how about a bit of cross country skiing? Gatineau Park is located just across the river and has over 200 kilometres of well groomed trails. Downhill skiers are also well catered for in Ottawa with both Camp Fortune and Mount Pekenham situated less than an hours drive away. With no less than 2000 restaurants to choose from, it should come as no surprise that Ottawa is a foodies delight. Highlights include crepes at Baker Street Cafe, fine dining at Beckta and spectacular sea food at the Pelican Grill. Meanwhile, international cuisine can be sampled in the cities beautiful foreign districts such as Chinatown and Little Italy. Each February, Ottawa comes alive with the annual Winter festival, Winterlude. This year it takes place from January 31st until February 17th and if you’re in town, it’s not to be missed. Highlights include the ice slides of SnowFlake Kingdom and the international ice carving competition held at Confederation Park. The Byward Market is one of Canada’s biggest and oldest markets. Home to a wide range of stalls, restaurants and cafes, it’s the perfect venue for a family day out. Christmas trees, carollers and the smell of maple syrup combine to produce a welcoming and enchanting environment each and every Winter. Being the capital city of Canada means that Ottawa gets the lion’s share of the country’s best museums. Highlights include both the National Gallery and the WarMuseum. My personal favourite however would have to be the Canadian Civilisation Museum. If you want to learn more about Canada’s history, I couldn’t recommend a better place. Finally, we have New Year’s Eve, this year, visitors will have a choice of not one, but two outdoor events. The first can be found at Sparks Street Mall which promises hot food, cold drinks, live music and a fireworks show. The second event will take place at City Hall and is being hosted by the Scottish Society. This means kilts, bagpipes and an atmosphere that’s expected to rival Edinburgh’s annual Hogmanay party. Needless to say, hotels book out fast at this time of year, and advanced bookings are therefore very much recommended. The Minto Suite Hotel in Ottawa is a great place to start. Enjoy your trip! Posted in Inspiration and tagged with Canada, Festivals, Markets, museums, Ontario, Ottawa, winter. RSS 2.0 feed.